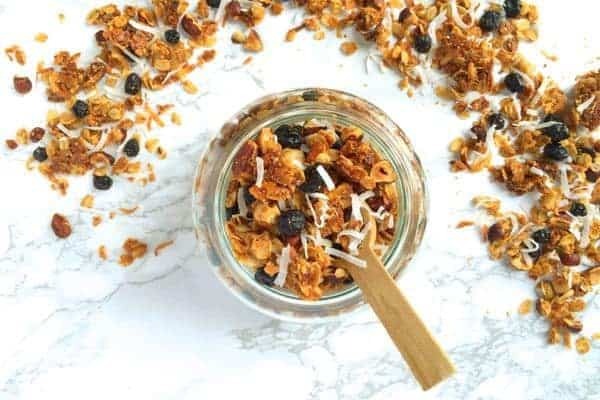 Toasted hazelnuts and sweet dried blueberries add flavor and texture to this addictive and healthy Coconut Granola with Blueberries and Hazelnuts. My husband is a granola-addict and eats it for breakfast almost daily. He isn’t picky and will eat almost any variety but I always feel a bit better about his obsession if I make him a batch from scratch. While convenient, store-bought granola is usually full of more sugar, salt and fillers than you need. Besides that, it’s crazy expensive and so easy to make at home. Homemade granola is not only cheaper but you can control the quality of ingredients. Plus, it’s fun to mix and match with whatever dried fruits, nuts and other ingredients you have on hand. This particular batch of Coconut Granola with Blueberries and Hazelnuts was inspired by a bag of chopped hazelnuts that I had on hand. 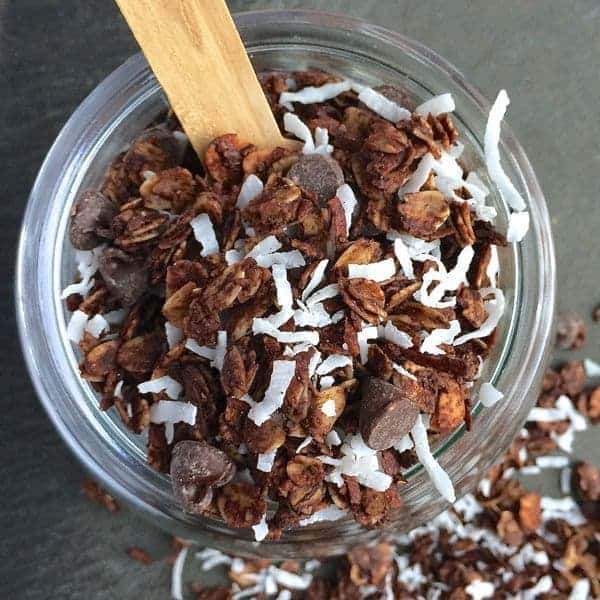 For a chocolate fix, check out my Almond Joy Granola. If you want to keep it old school, you can’t go wrong with the classic combination of raisins and brown sugar. The possible flavor combinations are endless. 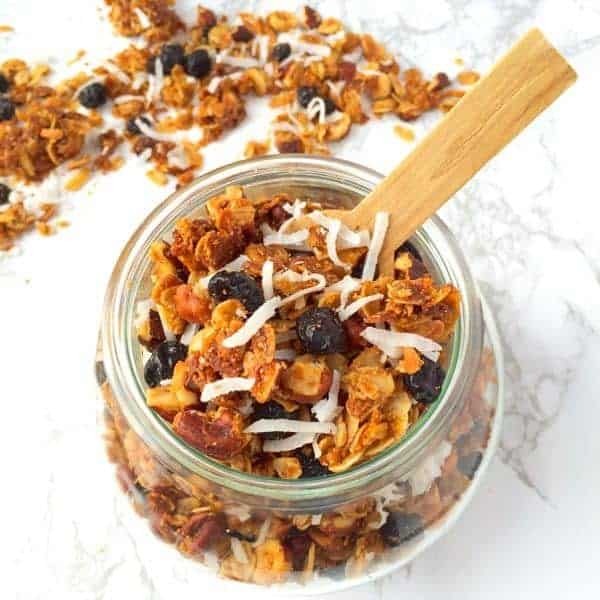 Toasted hazelnuts and sweet dried blueberries add flavor and texture to this addictive and healthy Blueberry Coconut Granola with Hazelnuts. In a large bowl, toss together oats, hazelnuts, coconut, flax seed, cinnamon and salt. Drizzle oat mixture with melted coconut oil and honey then use a rubber spatula to make sure all ingredients are evenly coated. 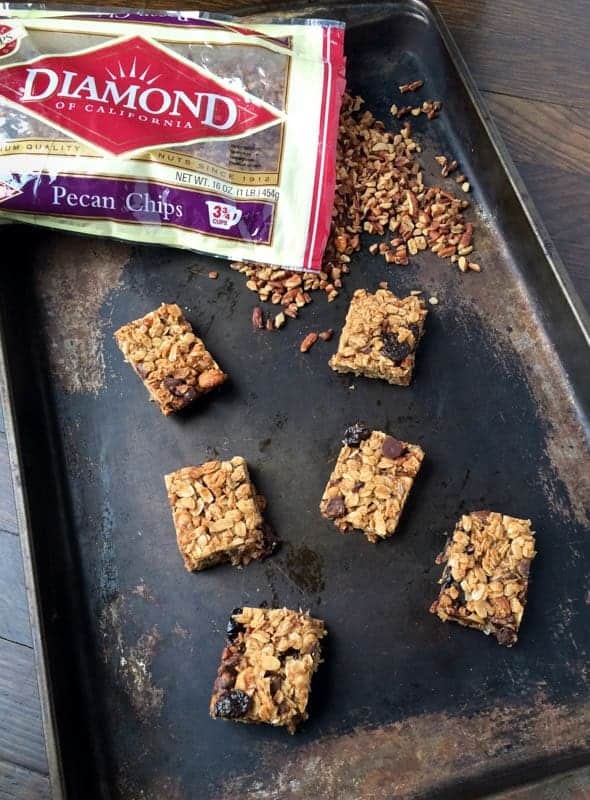 Line a baking sheet with oven-safe parchment paper or a silicone baking mat and spread granola mixture out in an even layer. Bake until golden brown, about 30 minutes, stirring once halfway through. Let granola cool on cooling rack for 30 minutes before pouring into a large bowl. Toss dried blueberries into the granola before serving. Can be stored in an airtight container for up to 2 weeks. I have been wanting to make granola for so long and decided to try this recipe. Well I couldn’t find hazelnuts in the store (and I’m in No CA where Diamond is!!!) so I used pecans. I was also craving currants, so I used those instead of blueberries. Loved it, in fact I can barely keep my hand out of it! And my son who wont eat breakfast cereal ate a bog bowl of it this morning. Thanks! This recipe sounds great. I like a low calorie granola, and this one has a great nutritional profile. I make my own granola (I’ve only bought granola rarely), and I have a recipe that my husband loves (I do, too). I’ll have to try this one, too, even though my husband always says, “If it ain’t broke, don’t fix it.” I think we would like this one. I made this tonight and followed the directions exactly…and it was burned 20 minutes in. Are you sure 400 is the right temperature? Oh no!! 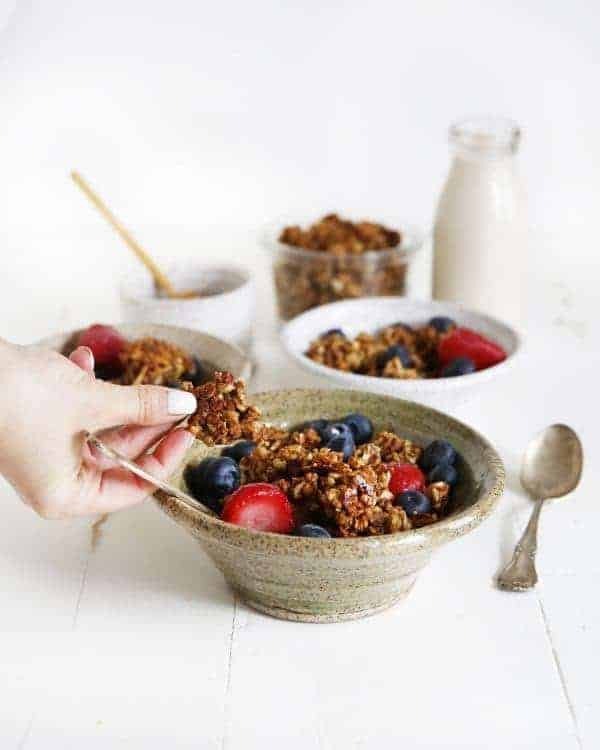 I tested this again at 400 earlier this week and it didn’t burn for me but I would rather people not burn their granola so I’m going to revise the recipe to a lower temp. I know every oven can be a bit different. I’m so sorry yours burned!! We loved this so much – hence we make it all the time! Granola is such a great, filling snack! I’ve been really craving a bowl of granola for breakfast, and here you are with this. Seems like kismet. I think it’s a sign you need to make this! Dried blueberries are one of my most favorite things ever. This granola is pretty much perfect! 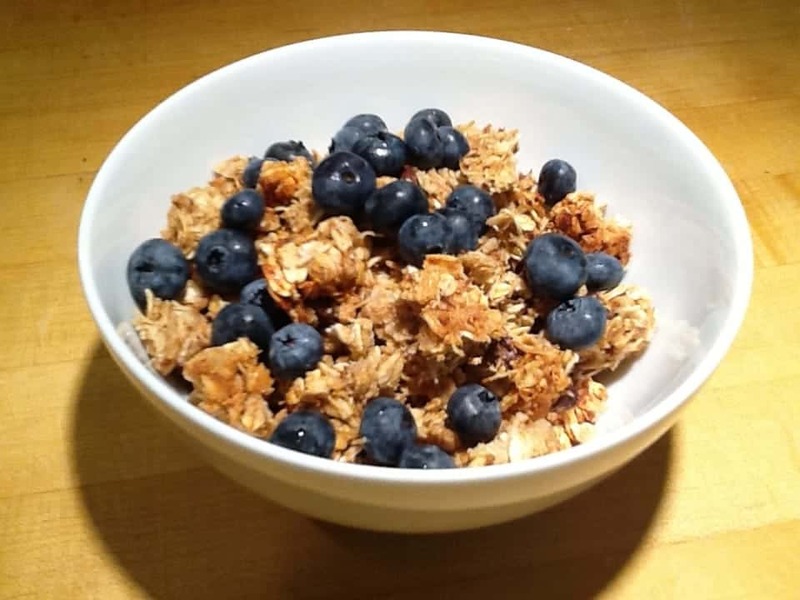 Coconut granola is my favorite – love your blueberry version! Oh my, this granola looks amazing! I love the addition of hazelnuts. I need this in my pantry ASAP! Pinned. I love the idea of homemade granola. You know exactly what goes into it and that would make me enjoy it more! Ughhhh every time I see a homemade granola recipe, I’m like WHY don’t I ever make homemade granola?? What’s wrong with me?? It looks so delicious and healthy and just perfect. You MUST make homemade granola!! Soon! I would eat a helping of this over store-bought granola any day of the week. And hazelnuts…you’re speaking my language. I want to ship you a batch!! My hubby is such a granola eater too! BUT, I am the worst and buy the sugary-laden stuff. But, with this coconut, hazelnut and blueberry combo? I may just have to make my own! Pinned! Same here Taylor!! It’s his all time favorite! I always intend to make granola but I never get it done, this would make such a great breakfast! You should do it and make a giant batch!! You’ll be so glad you did! I agree, granola is SO each to make (and so much cheaper and healthier than the store-bought stuff). It’s one of my favorite things to make! I used to make granola all the time at home, but I have fallen out of habit. This recipe gives me a good reason to start fresh again! Thanks for sharing Liz! Yay!! So glad to get you in the spirit again! fantastic! this really looks good. HAPPY ST.PATTY’S DAY TO YOU! Talk about stunning photos! This looks lovely, the perfect snack or breakfast. I’m a big fan of making my own granola. It’s nice to be able to control what ingredients are in it, as well as the nutrition. The one my husband likes best works in the slow cooker, which is great, because it’s easier to do that way (for me). This granola sounds very nice. It would go well with what I usually use it for, which is açai bowls. Love the idea of adding hemp hearts! I feel the exact same way! I adore granola, but I refuse to buy it. The extra salt and sugar is deterrent enough, but the price tag kills me. This version looks amazing! I hope you love this version!!! I love this uniqueness of this granola! Blueberries and hazelnuts? What an amazing combination! 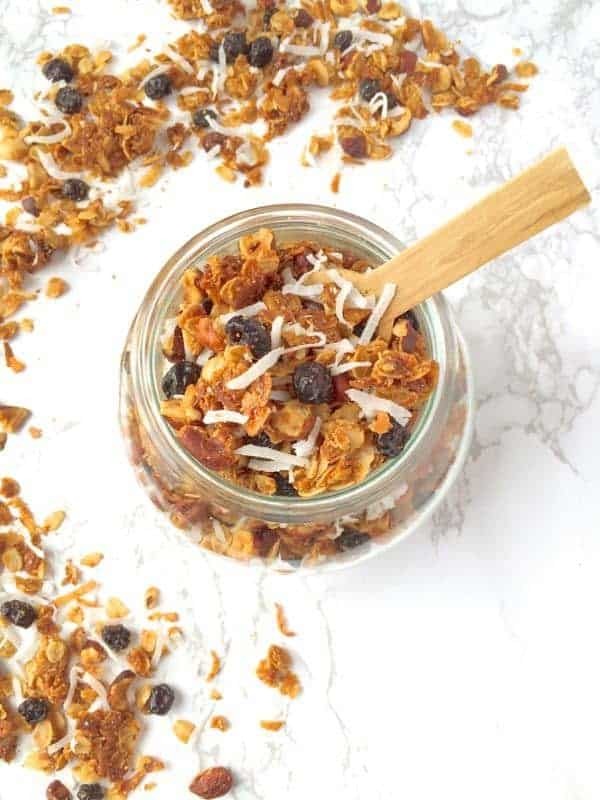 My husband loves granola too..but only when I make it from scratch (he’s clearly mr. fancypants) so i’m always on the lookout for great new recipes, can’t wait to try this! Love this! 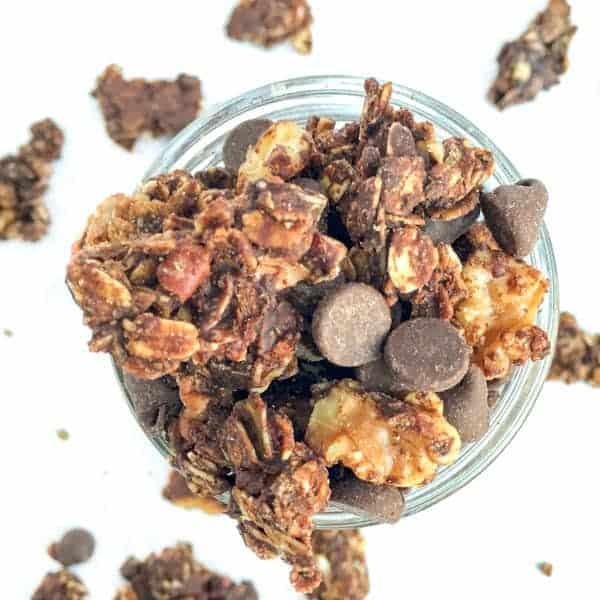 I’ve really been trying to limit the sugary snacks for my kids and I think this granola would be a hit with them! Totally!! Plus you can really control how much sugar you add. I am laughing because we both posted coconut granola today. ;) Love the blueberries and hazelnuts in this! Such a fun, new twist.